Looking for Chinese noodle place is a real hard task. It’s not an easy thing to do when you are looking for authentic flavors with beef and wonderful soup base. It took me awhile to do this as I was a bit skeptical about this place because it’s located in Temple City. That particular stretch of Temple City is considered “Old Town” where a lot of the shops, stores, and restaurants got that old rustic look of the 50’s main street. In a weird sense, it had a whole new renovations. Did you know what my friends called this street? Bridal Gown Avenue! Without even blinking, I counted at least 4 bridal stores surrounding this restaurant as I felt liked I’m trapped in the movie “Runaway Bride” with Julia Roberts going through various Bridal shops to look for that one perfect wedding gowns. Yes, there are many selections of stores to go window shop at. Trust me, I was looking down at the pavement and walked past these shops as fast as I can. 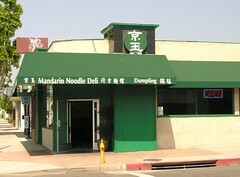 Mandarin Noodle Deli is a Chinese restaurant that got stuck in a decor of an Italian pizzeria. It’s safe to say that it had to be a different restaurant before this place opened up as it is currently. They did have their own unique sense of tables, but the counters in the register and the vast big window glass on the front and side door definitely have a design that does not match with a Chinese restaurant. It’s very weird and unique at the same time as it tried hard to establish an identity for this place. The big item I have to order is the beef noodle soup. 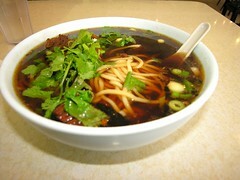 It is a thick yellow flour noodle with beef tendon on a mild spicy soup base. On a hot day, it will sweat you out. On a cold, this warms you up. Not too sour from the pepper and too spicy to finish off the soup. Their gyozas are nice additions to the beef noodle soup as they are very juicy on the inside and not too thick on the skin. 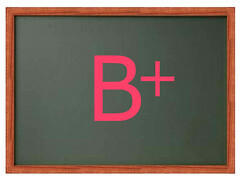 A lot of juice flowing when it is best served hot and freshly made. Be warned though, it will take at least 15 minutes for any dumplings. It only took 7 or 8 minutes for the noodle soup. They also have other small side dishes that you can order. It’s refrigerated fresh in the air conditioned counter on the front right next to the cash registers. The service was friendly and fast with a very generous helping of hot sauce when I requested it. Very friendly bunch of folks in this part of the town. One thing you have to carefully look is that the place is not very noticeable as I pointed out it’s has its own old town look to match with the other shops. I will have to come back and check out their other dishes. Definitely have to come here again for their noodle soups as it is great to have something like this being done right. Oh yes…cash only. Found that out the hard way.